Founded in 1983, the Comedy Showcase has been providing laughter, and exceptional service for over 30 years! Age Requirement: 21 to drink, but only 18 to laugh! How long are reservations held? Check our web site and Schedule for Specific Details – Special Event Prices and Rules Vary. Typically, shows are Friday at 8:00 and 10:30, and Saturday at 8:00 and 10:30. Group Tiered Pricing: Most weekend shows offer discounts for larger groups, if you purchase your tickets online, in advance. Discount pricing starts at 6 people, and drops again at 20 people. Check our discounts page for more information. Seating typically begins 60 minutes prior to early shows (8:00) and 30 minutes prior to late shows. Times, performers and prices may change without notice, please check the web site for updates. Purchase your tickets, in advance, using our convenient online ticketing system: www.JokeJointComedyShowcase.com and get preferential seating, even if you are late. Purchasing your tickets in advance guarantees your seat will be held at a show, even if you arrive late. Also, the online purchase allows slightly streamlined seating before the show, and you don’t have to hassle with cash or credit cards before the show. Call 281-481-1188 to reserve your seats, then pay for your admission as you enter the show room. You do not need a credit card to make a reservation. If you would like premium seats in the front section, to be held for you even after the show begins, then please pre-pay for your tickets using your credit card by ordering online. It’s never too early to start your party planning! Whether its a corporate holiday party, New Years Eve, birthday party, bachelor or bachelorette party, the Joke Joint Comedy Showcase is the place to be! 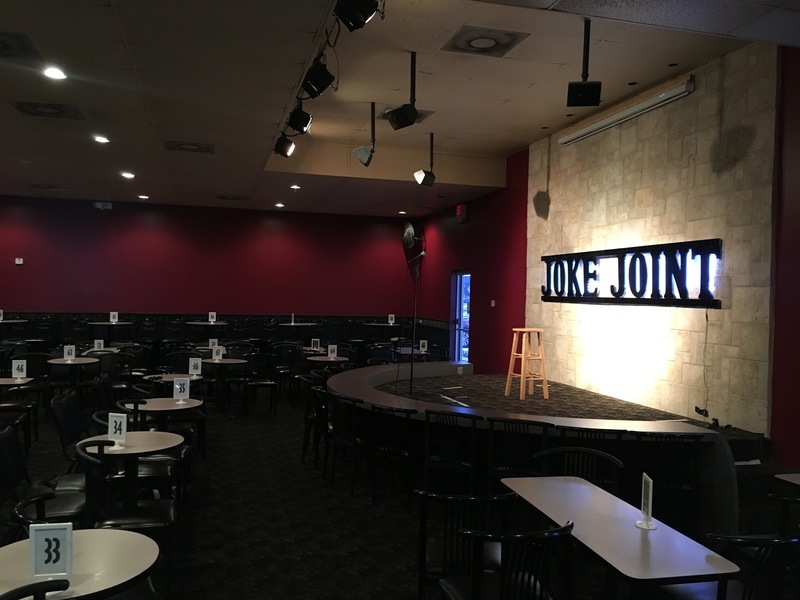 We can include your group in one of our regularly scheduled shows, or we can host your event, with standup comedy entertainment, in our show room! With advance notice, birthday parties, bachelor parties, and bachelorette parties include one free admission for the guest of honor. Corporate holiday parties are “corporate clean” shows: just as funny, without any uncomfortable language or topics that you can’t enjoy in front of the boss. Call the reservation line for more information: 281-481-1188! The show room is available to everybody 18 and over. Under 18 with parent or guardian. You may call the reservation line to inquire about the appropriateness of shows for those under 18, but please remember that this is a live performance and adult topics and language are likely to occur. Reservations are held until FIFTEEN minutes prior to show time. Pre-paid reservations will be held even after the show has begun. There is no photography or recording devices of any kind allowed in the show room. Please silence your cell phones and pagers. If you must take a phone call, please set your phone to vibrate and take the call in the lobby. No TEXTING during the show! Please keep your table conversation to a minimum. If you feel that you received poor service, or you did not enjoy the performers or the content of the show, please advise the person that admitted you to the showroom to receive a complimentary pass to return on another date or your money back.